Summary: The Axos P Elliptical Cross Trainer has futuristic good looks, a long stride length and the great reputation of the Kettler brand are reasons to choose this mid-range elliptical cross trainer. See this dedciated amazon.co.uk product page for the latest price, any current discount and a close up of the computer console. Electronically controlled magnetic resistance with 16 levels to really test you! 13 training programmes including heart rate controlled option. POLAR compatible receiver for use with chest strap (not included). This elliptical cross-trainer has a slightly futuristic look compared to many of the blocky looking models reviewed here. It is certainly not short on features with an LCD display (12 programs), Polar compatibility (you’ll need to buy the chest strap separately) and full 16 resistance settings which you’ll control manually. You can store training data for up to 4 people with this model. The 20 inch maximum stride length is another plus – this is plenty for most of us, even those above average height. If you are extra-tall then you might want to consider a 22 inch stride elliptical, though most 6 footers will find 20 inches just fine. Alongside this the heavy flywheel (18kg) keeps things super smooth and quiet. This elliptical also comes with a 3 year parts and labour warranty. 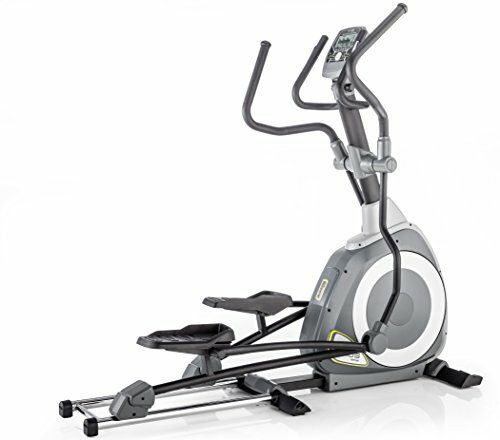 Finally, the Kettler brand is a plus – with a great reputation for creating home fitness equipment which is way better than the budget models. There is only one comment from a buyer at the time of writing. You’ll be pleased to know that this individual was very satisfied with their purchase and noted the quality of the build and fact that this model was easy to assemble. Check out the spec and user feedback for yourself on the product page over at Amazon.co.uk now!